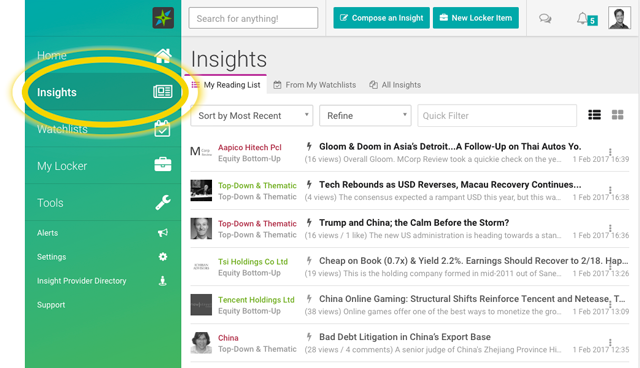 Once you log in to your account, select the Insights tab in the left-hand sidebar. Your reading list composition takes into account your reading preferences, watchlists and the insight providers you're following. 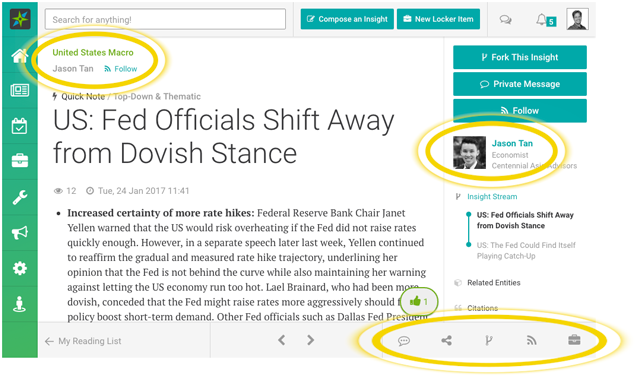 It also suggests relevant insights based on recency and other readers' interactions. From the reading pane you can also make use of the toolbar at the bottom to view other Insights in your reading list (by using the navigation arrows), comment on the Insight, share it via Twitter or email, follow the Insight Provider/Insight Stream and add it to your Locker (hold your mouse over the icons). More details about your Locker can be found here.